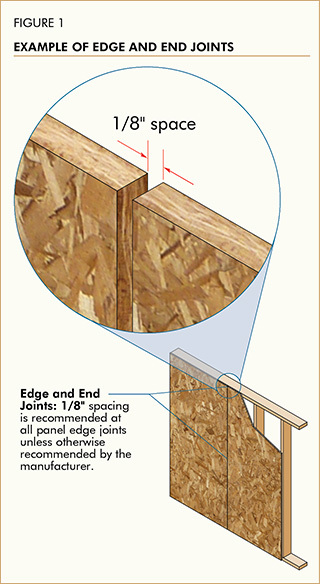 APA recommends a 1/8-inch space between panel edge and end joints. Plywood and oriented strand board (OSB), like all wood products, will expand or shrink slightly with changes in moisture content. If the wood structural panels are tightly butted, there is no room for expansion and buckling can occur. That can mean costly, time-consuming callbacks. 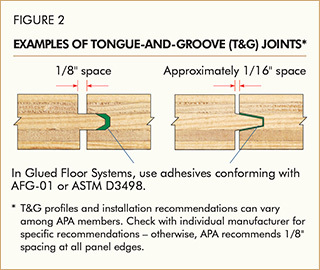 To assure best performance, follow these panel spacing and nailing recommendations for APA Rated Sheathing, APA Rated Sturd-I-Floor®, and APA Rated Siding. Spacing Hint: Use a 10d box nail to gauge 1/8-inch spacing between panels. Spacer-type panel edge clips may also be used for roof sheathing applications. Panel spacing is an APA RECOMMENDATION, to provide installers with a means of minimizing the potential for panel buckling; however, it is not a requirement. Some manufacturers may require a space at the time of installation. Panel buckling may be an aesthetic or serviceability issue but is not a structural deficiency. There is no reason to expect this recommended space to be maintained when the panel becomes acclimated. Gaps that were initially present may have closed due to normal moisture-related expansion. If the flatness of sheathing or flooring panels is acceptable, APA would generally recommend that any finish flooring, siding or roofing be installed as planned regardless of whether gaps are present. • Engineered Wood Construction Guide, Form E30 (Nail sizes covered in Table 5). • Technical Note: Temporary Expansion Joints for Large Buildings, Form U425. • Data File: Roof Sheathing Fastening Schedules for Wind Uplift, Form T325.